Shanghai Jiao Tong University’s president believes that China has discovered “a Chinese way to reach world-class status” instead of simply following Western models, citing the transformation of his institution as an example of innovation. Jie Zhang, whose institution is among the elite C9 group of Chinese research universities that benefit from the highest levels of government funding, was among the speakers at the inaugural Times Higher Education Asia Universities Summit. He also defended the gao kao – China’s national higher education entrance examination – after a Chinese student in the audience suggested it was unfair. The summit, hosted by the Hong Kong University of Science and Technology, was on the theme of how universities can nurture creativity and innovation. Professor Zhang, a physicist who formerly worked at the Max Planck Institute for Quantum Optics in Germany and the UK’s Rutherford Appleton Laboratory, took over at Shanghai Jiao Tong in 2006. At that time it “was just a very typical Chinese university, which lacked innovation” and was closely focused on engineering, he said. But since then it has become “a model of how one of China’s universities can transform itself into an innovative university”, he added. The three key steps Professor Zhang identified were in inspiring “curiosity-driven research”, creating new research groups, and reforms in structure to create a “sustainable culture for innovation”. The former director-general of the Bureau of Basic Sciences in the Chinese Academy of Sciences also said: “We took very serious measures to change the university culture by terminating the monetary incentives for paper publications in 2006.” This had been “ruining the culture of the university”, he added. There had been a consequent switch from paper publication research to “problem-driven research”, said Professor Zhang, along with a drive to attract researchers with global reputations from overseas. 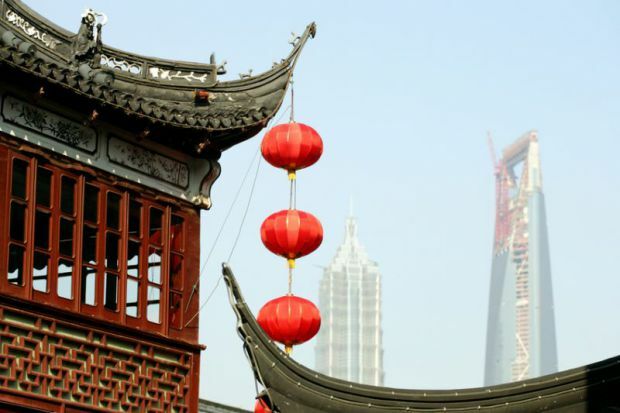 He envisaged that by 2020, Shanghai Jiao Tong would be made up of 20 to 30 “platforms of interdisciplinary research, hopefully which will give much stronger innovative capacity”. Average income per faculty member is “up 87 per cent in the last six years”, he continued. Answering questions from the audience, Professor Zhang said that 30 years ago “almost all” Chinese institutions “thought that American universities and Europe’s universities were models for China’s universities to follow. In the last 10 years, we gradually realised we have to add the better features of Chinese culture and also [the] Chinese way of achieving things. A female student, originally from mainland China but studying at a Hong Kong university, asked a question about the gao kao, suggesting that this “one-time examination” does not represent students’ abilities and that marks vary according to the province where students take the exam.